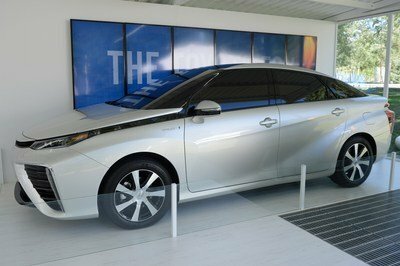 The fourth-generation hatchback is quite the looker! 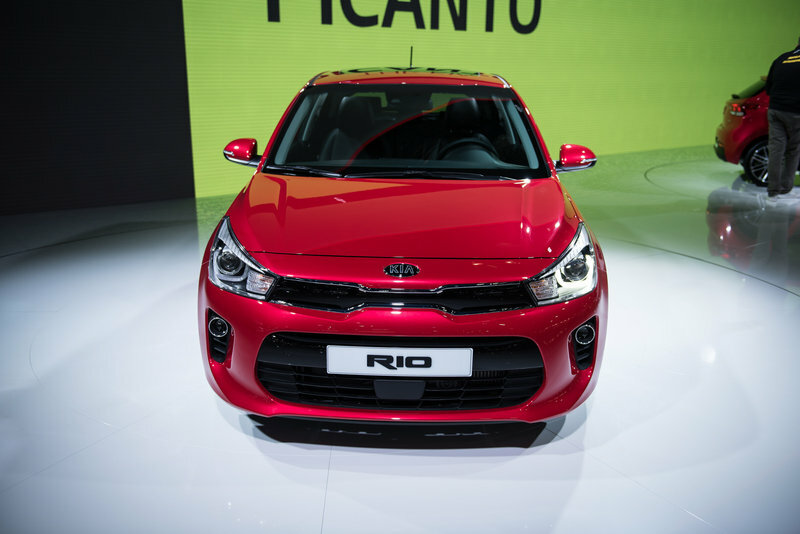 Introduced in 2000 as the company’s affordable, global subcompact, the Kia Rio is already in its fourth-generation as of 2016. Redesigned from the ground up for the 2017 model year, Kia’s small hatchback made its public debut at the 2016 Paris Motor Show went on sale in Europe and the United States in the first quarter of 2017. Much like its Hyundai-badged sister model, the i20, the Rio received a thorough makeover, now featuring a sportier exterior with styling cues borrowed from its larger, newer siblings. Longer, wider, and lower, the fourth-gen Rio aims to draw more customers into dealerships, particularly those who would rather purchase a Ford Fiesta or Volkswagen Polo. 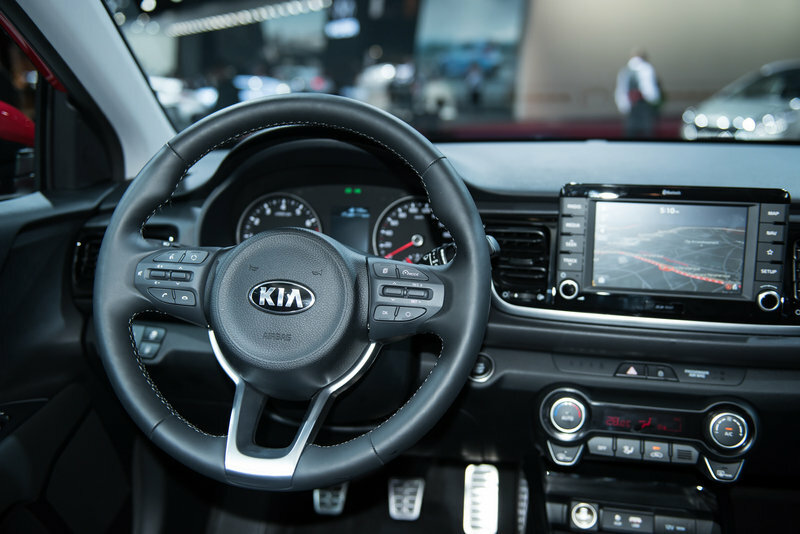 Kia promises "class-leading practicality and safety technology," and more "engaging ride and handling characteristics" to go with the more aggressive design. 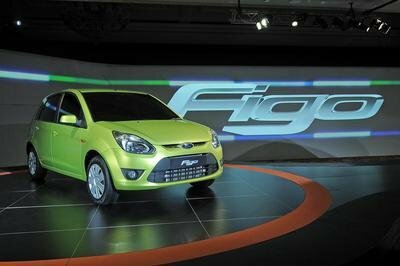 The Korean brand also aims to improve global sales of the Rio, which is the manufacturer’s best-selling model, with more than 473,000 examples delivered in 2015. The fourth-generation model entered production at the end of 2016 at the company’s Sohari manufacturing facility in South Korea. Continue reading to learn more about the 2017 Kia Rio. Design-wise, the fourth-generation Rio is massive step forward, borrowing styling cues from the company’s larger vehicles. 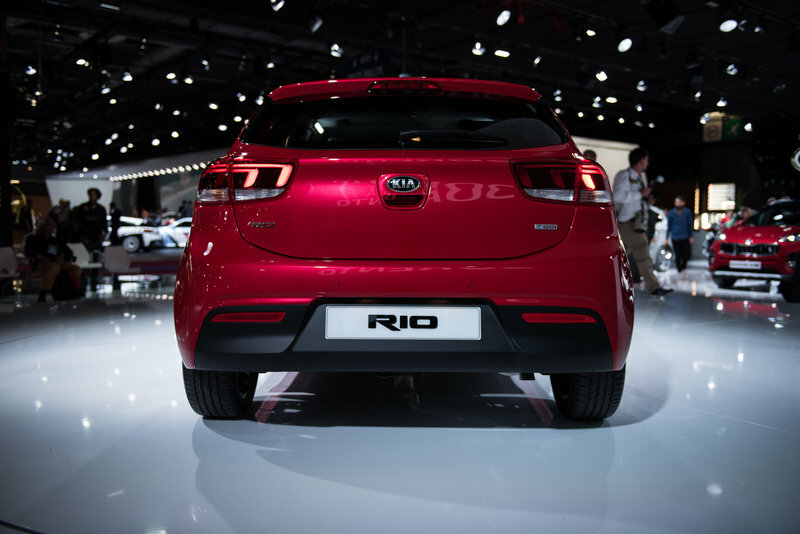 The result of a collaboration between Kia’s design centers in Germany and the U.S., the new Rio features more straight lines and smoother surfaces, which give it a sportier appearance, as well as ditching the somewhat cheap look of the outgoing model. The front overhang and engine hood are longer, while everything from the headlamps to the bumper have been thoroughly redesigned. The hatchback sports the latest evolution of Kia’s ‘tiger-nose’ grille, which is now thinner in height and wider across the front end. It also has integrated bi-function projection headlamps, also thinner and more sculpted than those of its predecessor, featuring new U-shaped LED light signature. The foglamps are also new and have been positioned outwards within the bumper, adding greater visual width to the front fascia. The rear fascia is also sportier thanks to its pronounced, angular features. The rear section is now more upright, with a near-vertical tailgate window, while the taillights are thinner and sport an arrow-shaped LED signature. A revised roof spoiler and new diffuser like element complete the new look. 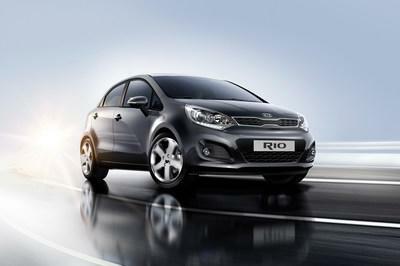 As far as dimensions go, the new Rio is 15 mm (0.6 inches) longer and five mm (0.2 inches) wider that its predecessor. It’s also five mm lower in height, while the wheelbase is 10 mm (0.4 inches) longer. 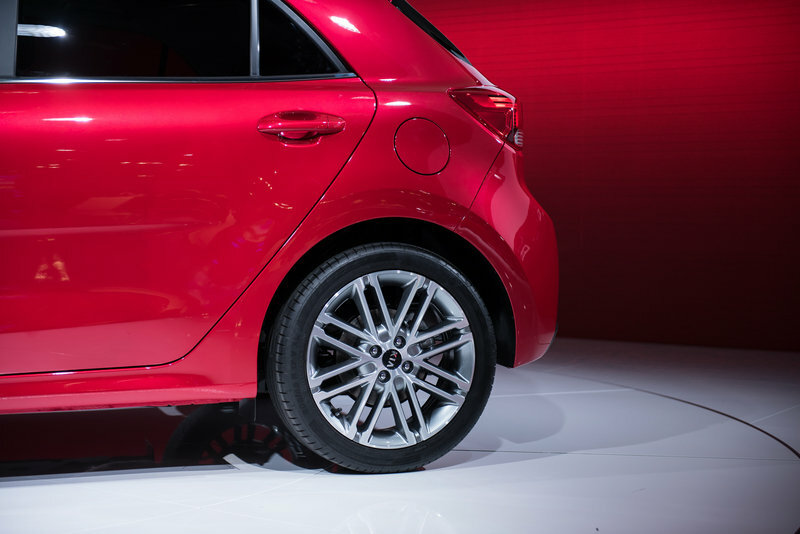 These figures might not seem very significant in the big picture, but they give the hatchback a more balanced look. Much like the exterior, the Rio’s interior is a massive improvement compared to the outgoing model. The massive chunk of plastic that Kia used to call a dashboard is now gone, replaced by a more modern looking panel that’s angled toward the driver. Featuring a "floating", high-resolution touchscreen in the center, the dash is also cleaner to look at. Other changes include trapezoidal A/C vents at the corners, a redesigned steering wheel, new door panels, a redesigned center tunnel and armrest, and a new instrument cluster. 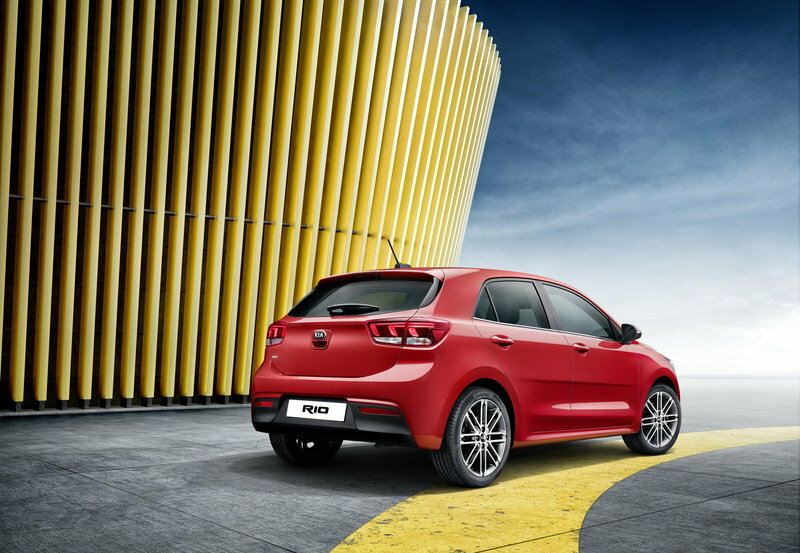 The new Rio is the first vehicle in its class to offer Autonomous Emergency Braking with pedestrian recognition. Smoother plastic surfaces and cloth upholstery now adorn the interior, giving it a more upscale look. The new Rio is available with a choice of black or grey cloth seat upholstery, or with black or grey faux leather. A Red Pack gives buyers black with red faux leather-trimmed seats. All upholstery options come with gloss-black and metallic trim. 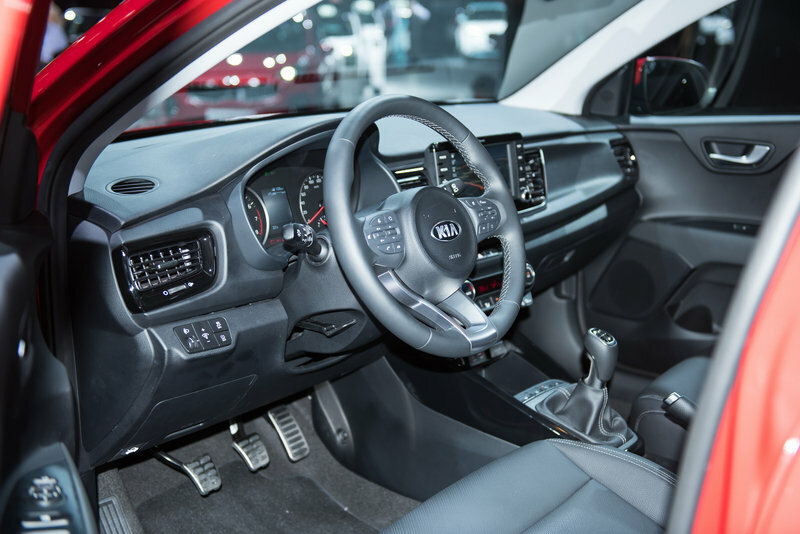 The longer wheelbase means enhanced legroom for rear-seat passengers, but headroom and shoulder room should have also improved given that Kia claims that the hatchback is "the most spacious in its class." Precise information is not yet available, but the company will spill the beans closer to its market launch. 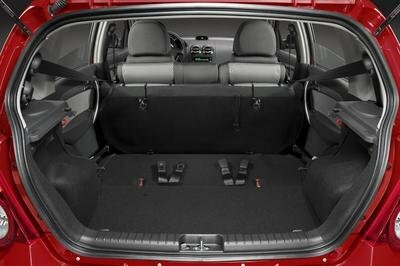 On the other hand, Kia did brag about the new Rio offering up to 11.5 cubic feet of cargo space, making it more practical than its predecessor. The new model is also the most technologically-advanced Rio ever produced, being equipped with new cabin technologies, safety systems, and connectivity features. The Rio comes with both Android Auto and Apple CarPlay integration (likely optional), and is the first vehicle in its class to offer Autonomous Emergency Braking with pedestrian recognition. Definitely a couple of surprising features for a tiny car, especially one with a Kia badge. Much like its predecessor, the new Rio is available with a wide range of drivetrains. On the gasoline front, there’s a 1.25-liter four-cylinder that cranks out 83 horsepower and 89 pound-feet of torque. This unit pushed the small hatchback from 0 to 60 mph in 12.5 seconds, to go with a top speed of 107 mph. Not exactly impressive, but this engine and the five-speed manual that comes with it returns 58.8 U.K. mpg combined. If you want a bit more oomph, you can order the Rio with the 1.4-liter four-pot, which cranks out 98 horsepower and 98 pound-feet. Paired with a six-speed manual, it goes to 60 mph in 11.8 seconds, while top speed is rated at 108 mph. Go with the four-speed manual and the sprint drops to 13.4 ticks, while top speed drops to 103 mph. The third petrol engine is a 1.0-liter turbo. This tiny three-pot generates 99 horses and a solid 126 pound-feet and delivers the quickest version of the Rio you can buy. Getting to 60 mph takes only 10.3 seconds, while top speed is reached at 108 mph. A more powerful, 118-horsepower variant is available with the First Edition (0-to-60 at 9.8 seconds and top speed at 118 mph), but this one is limited to certain markets and won’t be around for long. Both the five- and six-speed manuals are available with this engine. Moving over to diesels, there’s just one option, the 1.4-liter CRDi. However, this mill comes in two flavors. The base engine is rated at 76 horsepower and 177 pound-feet of twist and accelerates from 0 to 60 mph in 13.5 seconds. Fuel economy is impressive at 80.7 U.K. mpg combined. The more powerful version of this engine cranks out 89 horsepower and the same 177 pound-feet of torque. Charging to 60 mph takes 11.6 seconds, while top speed jumps from 102 to 108 mph. On the flipside, mileage drops to 74.3 U.K. mpg combined, which is still pretty good for this segment. The oil burner comes with a six-speed manual. 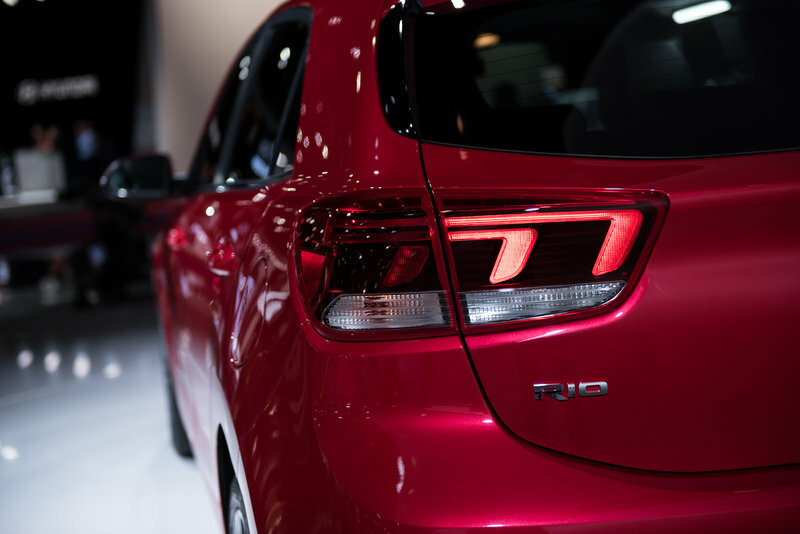 Pricing for the Rio starts from €11.690 in Germany, a significant €1,700 hike compared to the outgoing model. In the U.K., the base model costs £11,995, while the range-topping First Edition version retails from £17,445. U.S. pricing is not yet available, but the new Rio should cost more than the $15,495 that Kia is asking for the old hatchback. 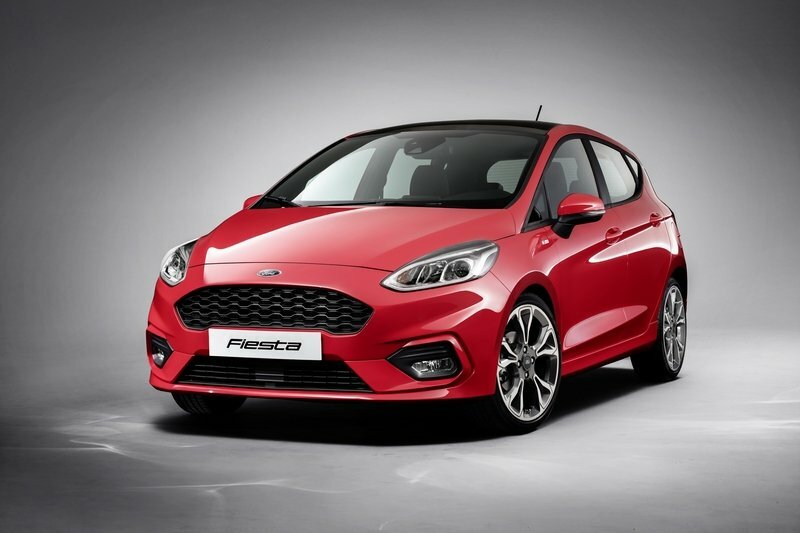 Redesigned for the 2017 model year, the Ford Fiesta is fresh, but sports an evolutionary exterior that’s still based on the previous model. Major changes include a redesigned front grille and headlamps, as well as a significantly revised rear end that now boasts horizontal taillights. 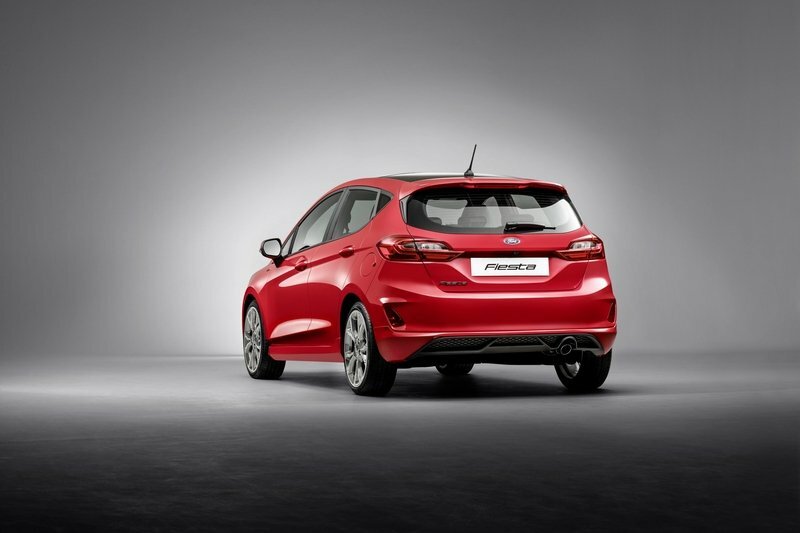 Overall, the new Fiesta is more athletic. Inside, we’re dealing with a brand-new cabin with modern technology and a cleaner design. There’s a 4.2-inch display in the instrument cluster and a 6.5-inch screen in the center console on top of revised seats, door panels, and upholstery options. Apps include Apple CarPlay, Android Auto, Spotify, and HearMeOut. Three engines are offered under the hood. The naturally aspirated 1.1-liter three-cylinder mill comes in two flavors — a 69-horsepower entry-level model and an 83-horsepower version. Next up is the already familiar, 1.0-liter EcoBoost with 98, 123, or 138 horsepower. Moving over to diesels, Ford offers a 1.5-liter four-cylinder rated at either 82 or 118 horsepower. The 1.0-liter can be had with a six-speed manual transmission or a six-speed automatic, the diesel is only available with the six-speed manual, while the 1.1-liter gasoline engine gets a new five-speed manual gearbox. Pricing starts from €10,900 in Germany and from £12,715 in the U.K. 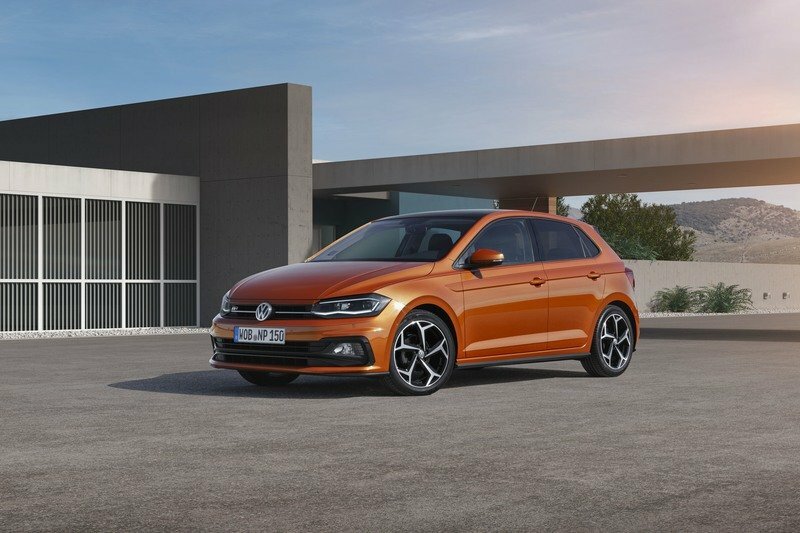 The Volkswagen Polo is currently one of the best-selling superminis in Europe and the 2017 redesign will keep it that way. Although the new design is obviously evolutionary, the Polo is a brand-new car on the inside. 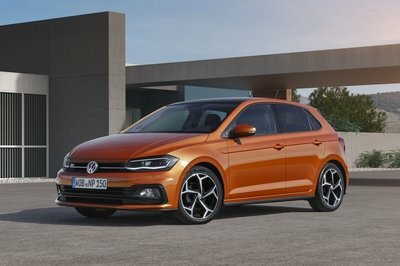 Borrowing styling cues from the larger Volkswagens, the Polo’s cabin sports more premium features than ever, it has become more customizable, and brings a host of new technologies to the table. Segment-leading tech includes Front Assist monitoring with City Emergency Braking and Pedestrian Monitoring, Blind Spot Detection, and semi-automated Park Assist. It also has all the latest apps, including those you can find in the Rio and Fiesta. Engine-wise, you get plenty of options, starting with the 1.0-liter turbo that cranks out 65, 75, 95 or 115 PS. There’s also a 1.5-liter TSI with 150 PS, while the 2.0-liter TSI in the Polo GTi cranks out 200 PS. 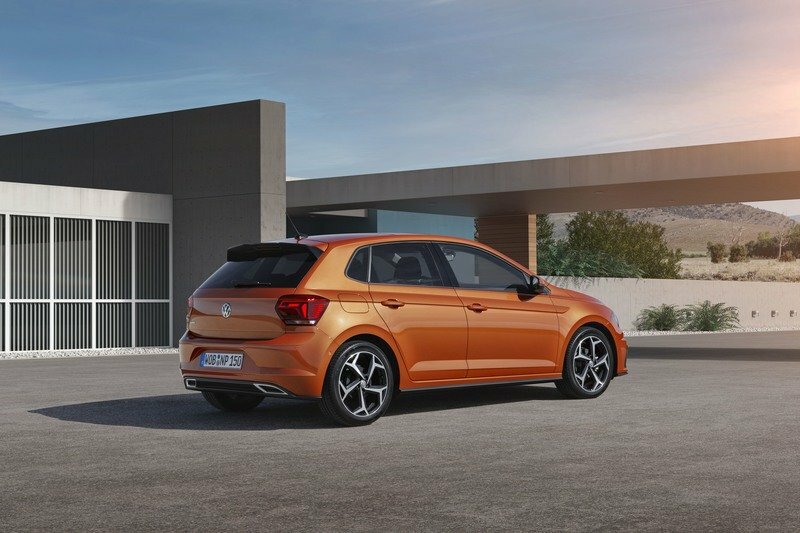 A 1.6-liter diesel with 80 or 95 PS is also offered, and unlike its rivals, the Polo also comes with a natural gas option in the form of a 1.0-liter unit rated at 90 PS. Pricing starts from €12,975 in Germany. Learn more about the Volkswagen Polo here. 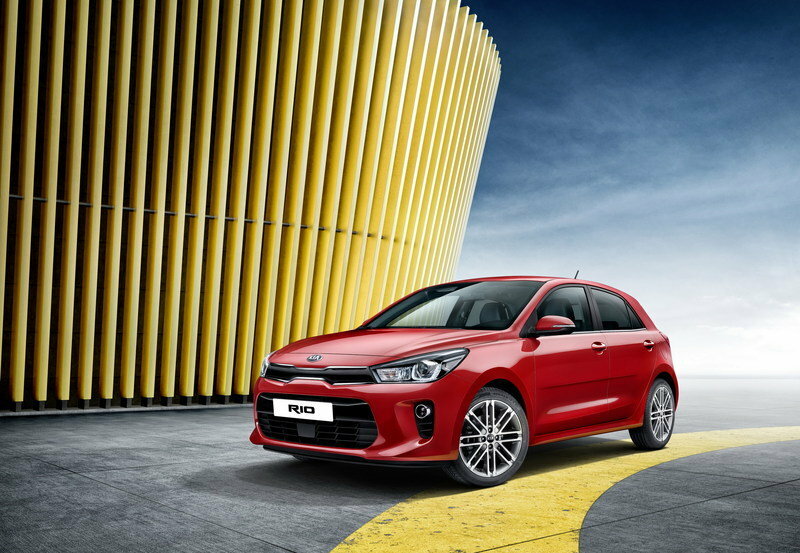 Needless to say, the fourth-generation Kia Rio is a significant departure from its predecessor in both design and technology. The Rio was in desperate need of better cabin materials and enhanced technology in order to give the Volkswagen Polo and the Ford Fiesta a run for their money, and the fourth-generation has both. It also has better engines, a roomier interior, and segment-first features, which is proof that the Korean automaker is finally letting the more modern design and technology found in the larger cars trickle down into its smaller products. Granted, that’s great news! 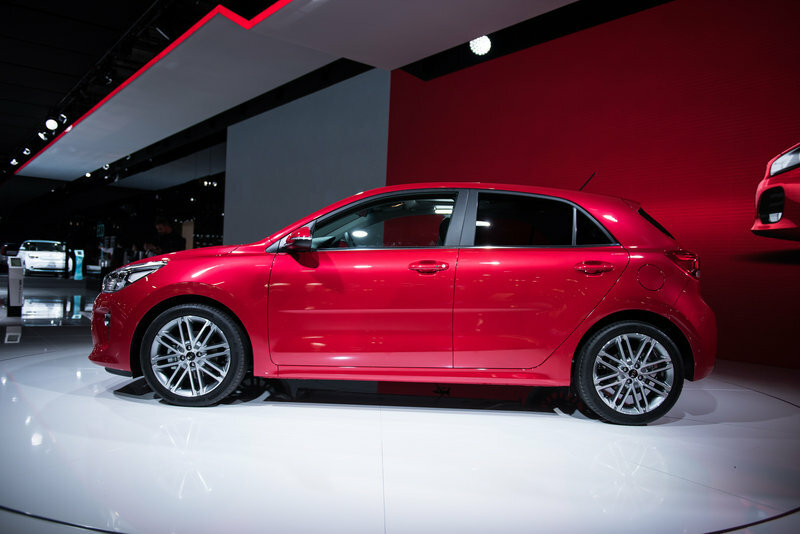 Updated 09/01/2016: Kia dropped the first official details on its new generation Rio with one month before the car’s official debut at the 2016 Paris Auto Show.